Sean Stephenson Interview and Podcast: Sean is a remarkable gentleman that my father, Barry Dunlop met in Necker Island along with Sir Richard Branson. 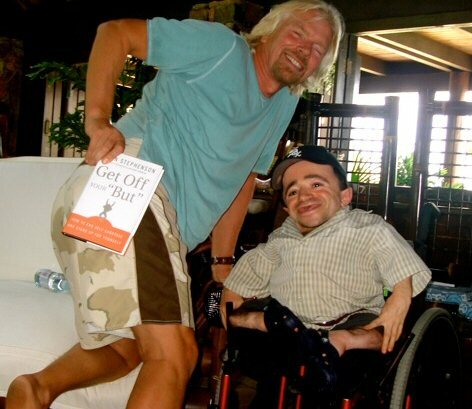 Sean has written Get Off Your But a book which I have just completed reading this week. This is I believe the most inspiring and motivating interview we have ever done. This is not an interview about how to make more money, it is an interview about something far more important – How to live a happier, more productive, more rewarding life. We all live busy lives but do yourself a favor – listen to this Podcast in its entirety or read the transcription completely – I am confident you will be inspired in a way that many of us will have not experienced before. You will also learn some of the remarkable distinctions made by a truly remarkable human being. Barry Dunlop: This is Barry Dunlop at IncomeDiary.com. Michael’s not online this evening, actually, but I am and I have a very, very special guest this evening. It’s Sean C. Stephenson. Now, you’re going to hear a lot more about Sean, both from me and from Michael and right across the world because Sean is one of the most remarkable human beings I’ve ever met in my life. I was very fortunate recently, I happened to go to Necker Island — that’s Sir Richard Branson’s private island — and I got to meet Sean for the first time and Sean just blew me away. I can’t really explain it because… The reason I can’t explain this is because there’s something about Sean that I’ve never witnessed before and I would only use the word “energy”. I don’t want to sound too “mumbo-bumbo” or anything like that but it was energy. I completely went for his energy straight away and within moments Sean was giving me his book — signed, autographed — “Get Off Your ‘But'”. That’s b-u-t not b-u-t-t: “Get Off Your ‘But'”. Sean Stephenson gets Sir Richard Branson of his But! But what I would like you to do, if you can, because I have the benefit this evening of being able to watch you on video: just introduce yourself. Who you are, tell us just the shortened version of the “Life of Sean”. Sean Stephenson: Well Barry, thank you for having me on the program. I was born with a magical life. 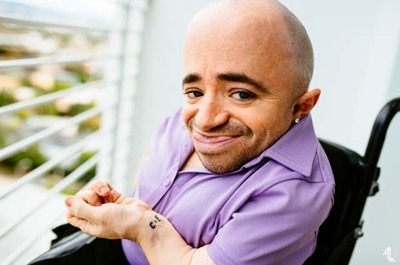 When I was born I came into the world with a condition called “osteogenesis imperfecta” — also translates into brittle-bone disorder — so when I came out basically every bone in my body was crushed from just the process of birth and they were pretty certain that I was going to die within the first 24 hours of my life. Sean: So my parents were told to grieve on the day that they were supposed to be celebrating. They were told to grieve for one of two things: either the loss of their baby or the loss of a normal baby, because they weren’t going to have a normal baby. They told them at birth I had a rare condition that, if I even got to live, my bones would fracture for little or no apparent reason and I would be stunted in growth and be of short stature my entire life, if I even got to live. So, that’s a lot to put on a human being, especially when they’re supposed to be celebrating and so my parents made a decision at a very critical period of their life: that this condition was not going to consume my life, it was not going to take me out of this world and if there was anything they could do to expose me to the world in a positive, uplifting, human manner they would. And they have! Sean: My parents have an amazing marriage, they have been the best role models that a human being could ever ask for and they are some of my closest friends as well as being my parental figures. They raised me and my sister, who does not have my condition — she’s two years older than me — they raised us with the mentality that anything was possible. So I went on to live a great childhood amidst all the physical pain… And I incurred a lot in my first 18 years of my life, Barry. I fractured my bones over 200 times. Sean: Yeah. Something as simple as sneezing would fracture a rib or a collarbone. If you can imagine… You know, most people get one broken bone in their whole life, if at all, and it hurts just as much for me as it would for you except I have to experience it on repeat occasions. I also had numerous surgeries to try to straighten my legs and all the surgeries failed because my body rejected the procedures. I spent my whole life using a wheelchair for mobility. Some people say I’ve been confined to a wheelchair, I disagree: I think I’ve been given freedom by my wheelchair. I’m only about three feet tall because it causes the bones to be extremely stunted in growth. So here I am, three feet tall, just turned 30 years old so the doctor’s prediction was certainly wrong — thank God! — and I use a wheelchair to get around and I have assistants that help me get in and out of vehicles and help me with everyday, ordinary thinks like showering, toileting… All those things I can do but I need help to do. All the organs that are in my body are normal sized and in normal operation. I can have children, I have feeling in all my body and I live a great life. I often say I live the life of a rock star because I travel the world. I’ve been to practically every state here in the US. I’ve been going on, I think about eight countries that I’ve been in. I’m picking up three more this month and I am somebody who has made the most of his time. I’ve become an author four times over. I’ve written four books. I’ve filmed a fitness video with Miss Fitness Universe and I can’t lie: I liked that one. Sean: I’ve got an amazing social life with a group of friends called the Sean-tourage. I didn’t come out with that arrogant moniker, that was an individual who dubbed the name of those that hang out with me as the Sean-tourage. Now in my life I’m a Board Certified Therapist. We can talk about how I got into that. I have a speaking career that I’ve had going on for 13 years now, traveling the world speaking at companies and schools about this concept of ending self-sabotage and I have an amazing dating life. You know, I go to bed every night wishing I didn’t have to dream because my life is more exciting than my dreams. Barry: Wow! Well… [laughs] There is so much you’ve said there Sean that I would like to talk about. I mean, the one thing that I found most remarkable about you, in fact, actually it’s in your book. It says: “Watch out what you say to yourself.” Now, I’ve been listening to you there and you’ve said things which really you wouldn’t expect somebody in what most people would consider your condition or your situation to be saying things like these. Like you said, used that word right at the beginning: magical life. That wouldn’t be the word that most people would have used and if you use words like “the freedom from your wheelchair” you clearly look at things almost like — can I dare to suggest this? — the opposite to just about most people. So, what made the change? When did the change happen? When did you suddenly decide to look at things differently or where you — I don’t believe you were, but… — born that way? You just were a positive individual to start with? I can’t believe you did, I mean, there must have been some learned behavior, something that came along a made a difference. Sean: Well, it’s a hybrid really. It’s probably the number one question I get on this planet, is: “Have I always been this way. Personality-wise?” It’s a hybrid answer because it’s… You know, when you’re raised in an environment that is just so positive and loving, that has a great impact on you and I had that to start. I know that’s not something that everybody gets, so I was fortunate. So, a good part of my attitude we can’t discount came built in because of my parents and my sister and my extended family raising me. That’s at least 50 percent of the equation. The other 50 percent was I had to pick up the ball and run with it. I had to make something of the life that I had. I could have had a great support system and still not done anything with my life. There were pivotal moments in my life that I talk about in the first chapter. When I was in fourth grade my favorite day of the year, I don’t know if it’s this way over in the UK, but Halloween is really popular amongst kids here. Barry: It’s popular here, too, Sean. Sean: Yeah, so kids dress up. And there was only one thing I really wanted in life more than anything as a child was to be able to blend in and be normal and just like everybody else, which is the opposite of what most kids want. They want to stand out and be different. So there was one day of the year that I got to do that, and that was Halloween. All the kids got dressed up and nobody stared at me. So I loved Halloween. I was in my costume, and I was rolling around in the living room. I caught my left leg on the corner of the door. I bent it back and snapped the femur bone, the large thigh bone. My mom came running into the room, and she knelt down beside me, Barry. And she ran her fingers through my hair to calm me down. We would play this little game every time I would break a bone, Barry. It was ‘What was your favorite part about our last vacation?’ Except, that day I was so angry I didn’t want to play any more games. Barry: Wow, that’s an amazing question. Sean: And, before I could tell her she was crazy, something magical happened, something mystical, something that I can’t explain with science. It was like this warm wind of wisdom just surrounded my body and I got clarity in fourth grade for the purpose to my life. The purpose to my life that I realized so young, at the tender age of 10-years-old or 11, whatever you are when you’re in fourth grade, is that everybody goes through pain. Everybody fractures. Just not with their bones. And I seemed to love my life amidst the fractures. God put me in this package to be fragile on the outside with the skeletal system so that I could help those that were fragile on the inside in their spirit. And, my purpose was to teach others how to love their life amidst their pain. Barry: That’s amazing, Sean. You know, I’ve obviously had the pleasure of meeting you in person. It’s very moving to listen to you because you just, so many of us complain and moan about things that really are not that big a deal. And what you inspire, certainly I’m a pretty experienced guy and I think I’ve done a lot of work on myself, but you inspire an entirely different level, Sean. You are a gift, I believe, to the world today. People who are listening to this, I cannot over recommend the power that will be delivered by your book, ‘Get off your but’. It really is an exceptional book. Actually, I’ll say this about it, because I’m not a tremendous reader these days. I do most of my reading online. It’s one of the easiest books to read as well. I personally think it should become one of the greatest self help books ever in history. I don’t know whether that was one of your intentions or even if you use the word self help, but to me it is that powerful. So, people who are listening to this podcast, or reading the transcript, I cannot, I really would not be possible to over exaggerate just how great this book is. It is just that wonderful, and that great. What I’m going to do, Sean, is because it’s one of those books also for guys like me who don’t necessarily start at the beginning and go right way to the end, but sometimes like to pick up a book and just get a bit of inspiration. And every time I do that, I get inspiration. I love lesson four, for instance. It’s a great example, focus your focus. And great statement, “Happiness is right in front of you.” Come on, explain that to the rest of us, Sean, please. Sean: OK. Well, the experience of life is not dictated by what happens. It is dictated by your interpretation of what happens. This is why guys like Viktor Frankl who wrote Man’s Search for Meaning, who was tortured in the Nazi concentration camps, can still find love in the guards that were hurting him, and survived because he realized that they know not what they did. You know, it’s the individuals like Nelson Mandela who are locked up by his own people and held against his own will, and then is released with no animosity. People like Mother Teresa who live in completely impoverished nations and yet create a movement for us to help those that are less fortunate. I mean, any one of those individuals, Martin Luther King, you know; any one of those people that we think of as going down in history of almost being iconic and mythical, like they’re almost not real. Those individuals had different interpretations than the mass populous. And I do too, because I hope to go down in history as being the human being who gave the cure to insecurity, that rid the world, or that vaccinated the world of insecurity. I know it’s possible, Barry. It will not make everybody comfortable because if you wipe insecurity off the planet, you also upset a lot of industries. Sean: They will have to change their marketing methods, because, you know, I don’t even claim to say that you need my book to feel good. I claim to say that my book will be an instrument to help you find what you want in this life. But it’s not the only thing you’re going to need. It’s just a tool. And whenever somebody comes along and says that a product, whether it’s a makeup company or a car company or a clothing line, and says that they have the answer to happiness, they are bold faced lying to you. Happiness is an interpretation, the optimistic interpretation of that which happens to you. Barry: Can you repeat that again? That’s so profound, Sean. Sean: It is the optimistic interpretation of that which happens to you. Sean: You know, when we have events take place, our ego likes to label them as good and bad really quickly, put them in boxes. And it’s so not the best way to live. The way to live is to believe that everything is good. The way to live is to believe that everything is a tool and that nothing is a weapon. I believe that I’m not delusional. I believe that evil does exist. I do believe that people do hurt others. However I also believe, from my training and my intuitive nature, that the hurt hurt and the healed heal. Sean: The only reason why another human being would hurt you is because they themselves are hurt. Sean: And this is why I get into negative relationship loops in business, in dating, in family. We keep repeating patterns because as long as you’re hurt, you’re like a cactus. Anybody that tries to touch you is going to hurt themselves. But as long as you’re healed, you’re like a glowing stone of miraculous proportion. When they reach out for you, they can’t help but be healed. Barry: This is really great stuff. A lot of people who come to our websites are looking for inspiration, if you like, and methods and ways to make more money. But increasingly I find a lot of people — they find all of those things, but actually they’re also looking for that happiness, if you like. And a lot of the happiness doesn’t come from money. Most people already know that. But just hearing your interpretation Sean, well it’s inspiring. And I keep coming back to the book. I love this one in particular. Again, it’s only, “Compare leads to despair.” I mean, most of us go through life making these unnecessary comparisons. And you just come right out and say it. Compare leads to despair. Want to elaborate on that just a little bit, Sean? Sean: I would, I would. Any time you compare yourself to others, you will end up miserable, and here’s why. If you compare as if you have more, then you will feel disconnected from those around you, and you will create moments of envy from those around you. You will build a superiority complex, and as we’ve seen in history, no one stays on top forever. Why would you want to be on a pedestal? First of all, you are far more vulnerable on a pedestal then you are laying down. I say that not just from the humility standpoint of try to act humble, but also any time you act better than somebody, you’re delusional. You’re not. You may know more, you may have more, but what you have could be taken away tomorrow and what you know may be obsolete or become obsolete. So, you are no greater than any other human being, and it causes pain for yourself and others to think that you are. Now on the flip side, it’s a lot more easy to understand this one. It’s a lot of pain to think you’re less than anyone else, because then you have the inferiority complex — that you don’t have enough. You’re not smart enough, tall enough, pretty enough, wealthy enough, cool enough — all of the enough’s. Right? The budding insecurities that I’m not… Any time you think, “But I’m not…” you’re comparing, because you’re using someone else as a benchmark. Barry: Wow. I just keep coming back to the same subject. If people listening to this are actually wondering what’s happening, I should explain. I’m actually watching Sean on video as he speaks to me, which is really quite exciting and fun. The fortunate thing for Sean is he can’t see me on video, but I want to tell you Sean — you look awesome, my brother. You look absolutely amazing. You know what I said there about, you can pick the book anywhere and you’ll find inspiration? This is something I actually happen to know was a fact already myself, but it’s so reassuring and so good to see other people coming right out and saying it. I understand that, Sean, but I know a lot of people don’t, so come on. Let’s help people with this “but, it’s not fair” disease as you refer to it. Sean: OK. Well I get that in the moment the “but, it’s not fair” is so real to you. I’ll give an example of the extremes. Some people say, “But it’s not fair I can’t bring my Chihuahua into this cafe.” Right? And the other extreme is, “It’s not fair I have to go into a foster home because my parents were killed in a car accident.” Those are both “but it’s not fairs”. Right? One is obviously more extreme than the other. It doesn’t matter though where in the gradation you are. “Fairness is an illusion” means… One day I was going along — to help you to understand how I came across this — and I just looked at life and then I went to a card game. I like to play cards. While I’m not much of a betting man, I like to play with my friends. And I started to think about how I was dealt a pair of twos. And in Texas Hold ’em, you can actually go all in and pretty much bluff the whole table that you have a great hand, and barely have anything, and everyone else folds. They may have better cards than you do. And then I woke up and I was like — I woke up here in life and I went, “Oh my goodness. It doesn’t matter what hand you’re dealt.” It’s does matter that you stay in the game. Do you play your pair of twos when you get them, or do you complain that you didn’t get the full house or the royal flush? It really doesn’t matter what cards you get because I’ve seen people that are gorgeous, tons of money, and shoot themselves in the face and leave their family picking up the pieces from a suicide. And you think, what happened? So it’s not what cards you’re dealt. It’s how you play and stay in the game. Sean: And yeah, I was dealt a hand where I’m three feet tall and in a wheelchair. But you know what? I’m out there actually seeing that as an advantage over the rest of you because when I come into a room I don’t need to do anything obnoxious or outlandish or anything to get attention. I just show up. And so, that gives me an advantage. Barry: I can vouch for that Sean. You just show up. Sean: When you start looking for the advantages to your condition, you really realize you weren’t given less or more. That’s what I say in the book. I talk about no one was given less or more. They were just given different stuff. If you’re given a spoon and I’m given a fork, who got a better utensil? Well, it all depends, doesn’t it? Because if I want to have cereal, you got the better utensil. But if I want to have a salad, I got a better utensil. Sean: So it doesn’t matter what you were given, because I promise what you were given can be used to great lengths. My family did a great job in raising me. My mom and dad taught me about adapting as one of the strongest tools that a human being has access to. And I learned because I was called disabled my whole life, and nothing could be further from the truth. Disabled in the real word means: not able. Barry, read my resume alone and you know that’s not true. 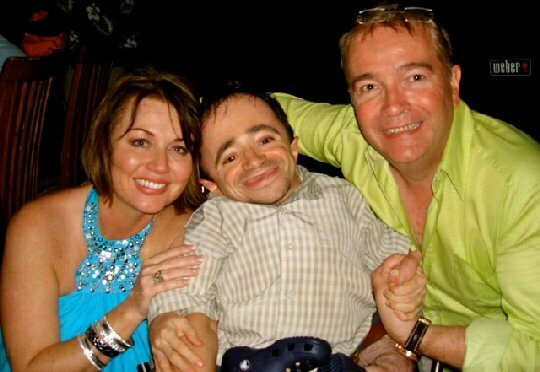 Sean: So I say this as humbly as I can, I am not disabled. And I’m not delusional. I have a physical condition, but that doesn’t box me in. Disabled means this — the only disability is one’s refusal to adapt. Because if something happens to me and I adapt and you don’t, who’s getting out ahead? Sean: Here in the States — I don’t know what it’s like over there — but we’re having some tough economic times. And look at it this way — you’ve got to adapt. You’ve just got to adapt, and we will come out. In the Great Depression there were more millionaires made per capita than any time in the world. Sean: It’s just snow, though, you know? I look at it as… My parents taught me when I was really young. I wanted to play basketball, Barry. I don’t know if that’s big over there, but here we have the National Basketball Association — the NBA. Barry: Yes. The distinctions you’re making here Sean — and I’m sure everyone who’s listening to this and reading this will be making the same distinctions — are just amazing, amazing distinctions that we can all pick up. All our lives are being bettered because of this. I did want to say something to you, because you mentioned the mentor there now. This is a question I would love an answer to. You mentioned Tony Robins. He was obviously one of your mentors. You’re parents mentored you as well. Is there any particular mentors that you would like to mention? Sean: Sure, sure. Do you have the book in front of you or near you? Barry: I do. It’s right here. Barry: Yeah. You’ve got James Arthur Ray. I’ve actually met James once. He’s a really good guy. You’ve got Ray Dodd. You’ve got Gary Coxe. I like the title of Gary’s book, “Don’t Let Others Rent Space in Your Head.” I mean, I would by the book just for the title. Sean: He’s a genius. He’s a genius. Barry: That’s a great book. David DeAngelo — we know who David is. Barry: Eben Pagan. You’ve obviously got Tony Robbins here. We mentioned earlier on, President Clinton. Susan Jeffers as well. Ken Blanchard. Jimmy Kimmel. The list just goes on and on. Sean: I can tell you out of all of them, the one that has been most pivotal outside of Tony Robbins and President Clinton would be Eben Pagan, who also writes by the name David DeAngelo. He was a massive part of my life, both personally and professionally. And for those who don’t know, he’s an online genius. He built up a company called Hot Topic Media that introduces online brands that make millions of dollars here in the United States. He has 80 employees, and they’re all virtual. He has no headquarters. He’s just a genius, and he’s just a caring human being. Barry: Yes, that’s an awesome point you make in that “one last thing.” It’s a one page as well. Barry: Why don’t we tell people what that is, because it is a very important distinction. Sean: Sure, sure. You want to find the one line where he asks me the question and read that to them? Barry: Indeed, yes. Eben says, “Sean, when does a person learn something?” You thought about it, and you said, “When they retain the information they set forth to absorb.” And Eben said, “Wrong. Learning doesn’t occur until a behavior has changed. As long as you know something intellectually, but you have not yet put it into practice, you haven’t learned it at all.” And actually, the reason it rings so many bells with me is because I can look at lots of things that I have learned intellectually, Sean, but I haven’t learned them at all. And I know there’s many more of us out there. So I love that. Barry: Powerful. Very, very powerful. Sean: Mentors have had tremendous impact on my life. There’s a whole chapter just about how you can’t foster a good life without a great (what I call) pit-crew. Barry: Yeah. I know you keep referencing that a lot, the pit crew. One other point you make, actually, lesson five, which is sort of relevant to what we’re talking about, is, “Choose your friends wisely.” Sometimes your life changes and maybe your friends have to change. Sometimes people think it’s possibly slightly arrogant to think that you have to change your friends. What’s your view on it? So how do you explain that? Sean: You can’t help those that don’t swim to you, who don’t want to put effort into making something of their life, of making something of a life with you, whether it’s dating, friendship, or business. You become like those you surround yourself with. I have a line that I get my clients to repeat on a regular basis, “When you’re in the environment, you become the environment.” I like playing around; what I mean by playing around is being silly, being goofy, partying, dancing. I like that crazy side to life, but it’s only about five percent of me. 95 percent of me is very stable, driven, focused, and clear and therefore my friends reflect that. If my friends were all that five percent of me, I would be getting nothing done. My body would probably be in jeopardy. My sanity would be out the window. If you surround yourself just with partiers, you will not be productive in any sense of the word. Barry: Again, an amazing distinction, Sean. I love that one. I love it. Thank you Sean – this is I believe our most inspiring interview ever. I really liked your “Happiness is right in front of you” comment. Great interview Dad, I really enjoyed reading Sean’s book, I love how he starts every chapter with a story! This is probably the most inspiring interview I have ever read (well listened too), Sean is truly remarkable. If we learnt just one thing from Sean, I’m sure it would improve our lives dramatically. You’ll have to excuse me now, There’s this book I wanna buy! Wondering what book you want to buy…. hmmm! This is definitely the best interview I have read in a very very long time. Hey guys! Once again thanx for an awesome interview! I could really relate with this one as my brother was recently diagnosed with ankylosing spondylitis. It is a disease that affects the joints in the spine and the sacroilium in the pelvis, causing eventual fusion of the spine. The thing is my brother only turned 20 this year and was fortunate enough to get a good job with a decent salary more or less directly after he finished with school. He was always into sport and a very promising tennis player and now this diagnosis has broken him. He does not want to go to work anymore, he only lies on the couch the whole day, which is exactly what he should NOT do as the bones fusion worsens every moment he is not actively moving the joints. I am sending him this interview with the hope that it would inspire him. Sean’s mother seems to be a very wise women, nothing could be more true: Is this going to be a gift or a burden in your life? Wikus, I hope it helps your brother! Sean shared some great advice and I think your brother should take advantage of it as soon as possible. Well it seems as though this has had some impact on my brother, took a while but he is steadily getting back into things. I suppose the shock of being diagnosed with any kind of disease is difficult to process… People can stand by you but in the end only you can help yourself.. emotionally, mentally and physically. Thanks again for the awesome blog! Till later guys! Great to hear from you again Wikus and happy to hear that your brother is changing his ways. Glad the blog is helping and keep the great work up with your blogs. Thanks for the interview. I really enjoyed it. I will pass it along to others. I hope that is okay. Well, it had me in tears! Very inspirational! And why is it that we, who have so much (including good health) are the ones who are whining all the time? What’s with that??????? All I can say is WOW, I can’t wait for my wife to get home from work so we can listen to this podcast (2nd time for me) Sean is truly an inspiration, not in a lofty unreachable way but in a very practicle “duh” way….I would venture to say that it would be dangerous to move one step forward in life without grabbing hold of Sean Stephenson’s ideas RIGHT NOW! A really interesting interview that challenges a lot of lifes current boundaries. Enjoyed it, cheers Michael, Barry & Sean. That was the best interview I have ever heard and read. It does not only depict the most important thing in life, which is “happiness”, but all the underlying factors one should learn from life. I believe in everything Sean said, because I am a cancer patient for two years now and I have never been happier. Indeed happiness is right in front of us and can be brought by seemingly the darkest event in our life. And yet if we look closely, tragedy (as most people call it) is actually beauty in disguise. Cheers!!! and thank you Barry for sharing with us that interview. Truly remarkable interview Barry! Very inspirational, not only to entrepreneurs but everyone. Best of the best interview. Very much inspiring. I’ve read this through my hear and I’m gonna make my life Far better. Now, guess what I too wanna meet Sean, maybe in a near future this happens. and Thank you Barry and Michael for this great interview. Man, I wonder if Sean’s mom came up with, ‘Sean is this going to be a gift or a burden in your life?’ off the top of her head. I want to be able to say stuff like that. Thanks for the Interview, Barry and Sean! This is inspirational, exeptionally inspirational. There is nothing more I can say.. my jaw is still hanging! I only wish I had his optimism. What an inspiring story. I need Sean to be my therapist, I really need someone to teach me how to see the positive in life. Amazing. Heart warming. Inspiring. Will pass it on. Michael: Can I translate into Spanish and publish on my personal blog? Of course, I would give you the credit and link back to your website…. Waiting for your reply… thanks! Ofcourse you can Omar 🙂 I woulod love to share Seans story with even more people. Michael and Barry, thank you so much for sharing this interview with Sean. I look forward to reading his book. His way at looking at things and choosing a positive perspective is very inspiring and refreshing! I must tell you that since I downloaded this interview (soon after it was posted), I have listened to it numerous times and am soooooooooooo inspired by it each time. Thank you so much for sharing…. I had to come into work today (a Saturday) and I was pretty annoyed and frustrated for giving up one of my days off. However, I now see it as a blessing as I wouldn’t of come across this amazing, moving, inspirational interview!! Sean you are an amazing Human Being!! and I can’t wait to meet you one day!! If we could tap into what this interview outlines, of really understanding the true beauty a human being has of being able to CHOOSE who you want to be and how you want to live your life regardless of what has happened to you or is happening to you…..image the possibilities we could achieve…. I feel so blessed to have read this interview. Iam really inspired, and lam fully fired up to get off my BUT, l will surely do, for if someone like SEAN can do it, l see nothing stopping me from achieving same success as well, God bless you. Sean Stephenson is really an awesome guy, and his story almost puts me to tears. Wow , Barry has been to Necker Island , and met Richard Branson? Great Interview. Very Inspiration. Really help put everything in perspective !!! I am going to make it a require reading to get a black belt from my martial arts school. Wow great human being, his talking about life reminds me that life is essentially an opportunity and the thing to do with that is simply to not miss it. It’s EXCITING. Just today, I was inwardly criticizing somebody whom I saw as “miserable for no real good reason” and was thinking how ineffective that all was, how LIMITING his attitude was, in his business and inter-personally… then I decided to flip that around and realize (admit) that I can be very much the same. Funny how we see our shortcomings so clearly in others.